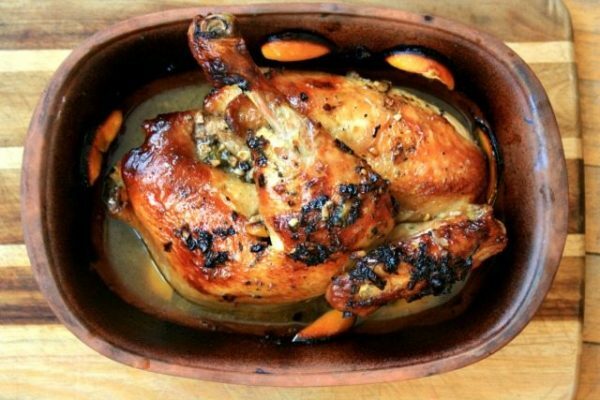 This lemon roasted chicken recipe is your friend when it comes to a super-easy, flavourful way to prepare chicken. I can’t seem to get enough of this lemon roasted chicken dish. It’s so easy and delicious that I have made it every Saturday night for the past four weeks. 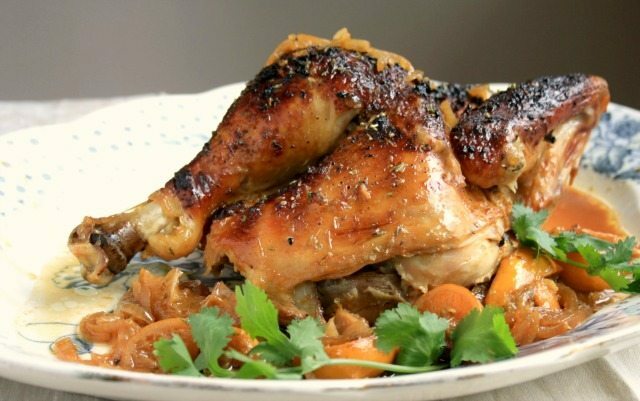 It’s a sure fire way to keep baked chicken moist and it works with whatever kind of chicken you have on hand. The molasses-soy glaze is spiked with garlic and citrus zest and adds great body and flavour. Baking the chicken covered helps to lock in all the juices. When I made it last weekend I threw in some olives, and a couple of weeks ago I added some smoked paprika and a bit of thyme. I have been playing with my mom’s clay baker from the 1970’s, which is what got me going on this recipe. This precursor to the crock pot is an amazing kitchen “gadget”. Your food cooks up moist but still manages to brown beautifully. 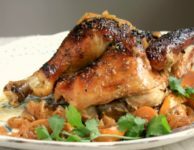 This recipe is adapted from a recipe I found on Fine Cooking. 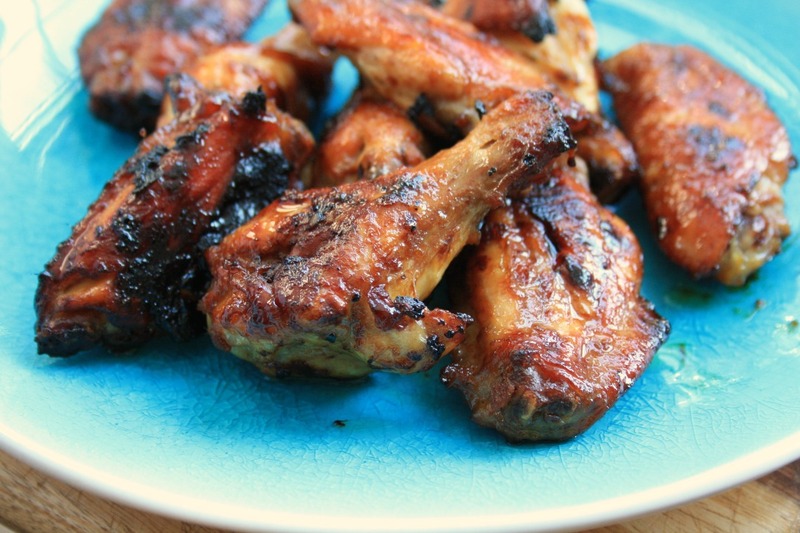 If you enjoy this recipe take a look at our recipe for Spice Rubbed Chicken (oven BBQ-style)! Zest and juice the orange and two of the lemons. 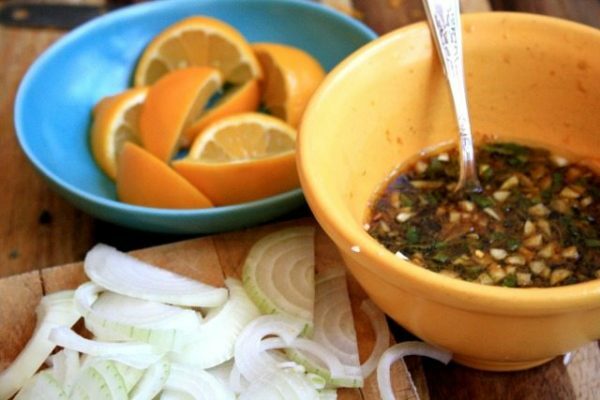 Place the zest and juice in a small bowl and add the soy sauce, molasses, oregano, garlic and crushed red pepper. Place the onions and bay leaf in a baking dish that has a snug-fitting lid. 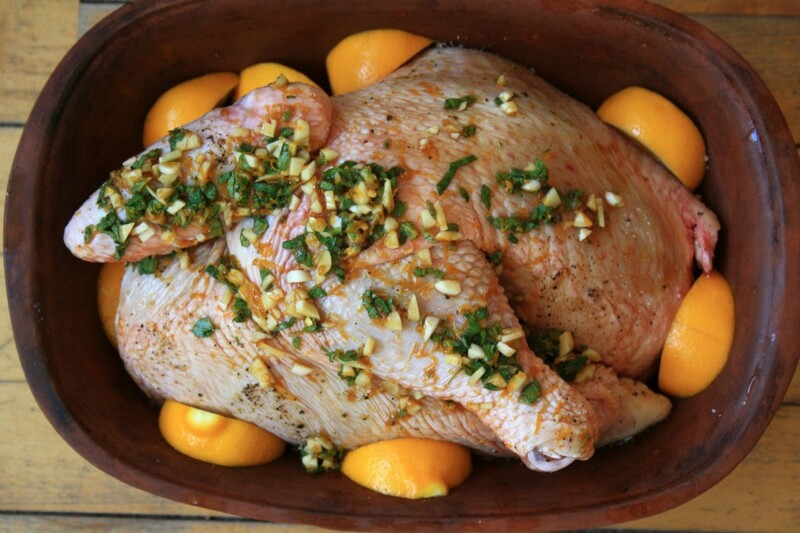 Sit the chicken on top and pour over the citrus mixture. Drizzle with olive oil, sprinkle with salt and pepper. Slice the remaining lemon into 8 wedges and place around the chicken. 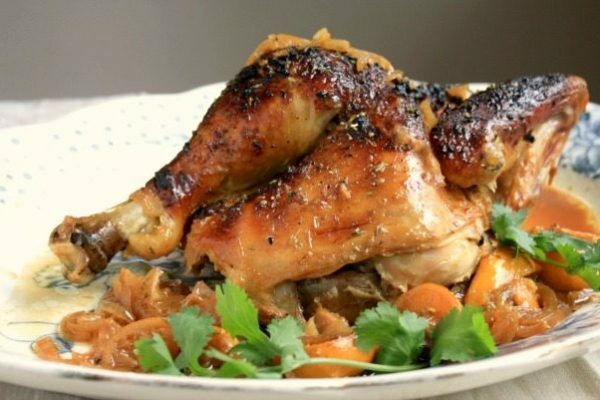 Put the chicken in the oven without the lid and broil for 8-10 minutes to brown the skin. Turn the heat down to 350 F, put the lid on the baking dish and bake until done, basting often once the juices start to release. The baking time could be anywhere from 30 min to an hour and a half, depending on the size of your chicken pieces. Bake the chicken at 350 F until done, basting from time to time once the juices start to release. When you think the chicken is just about done turn off the oven and leave it in the oven for another 15 min or so until it’s fully cooked. It look’s so delicious, i’ll try it on a Sunday night for supper when I have company. I love looking at the recipes you have ,they are all so delicious looking. Thank you Grace.